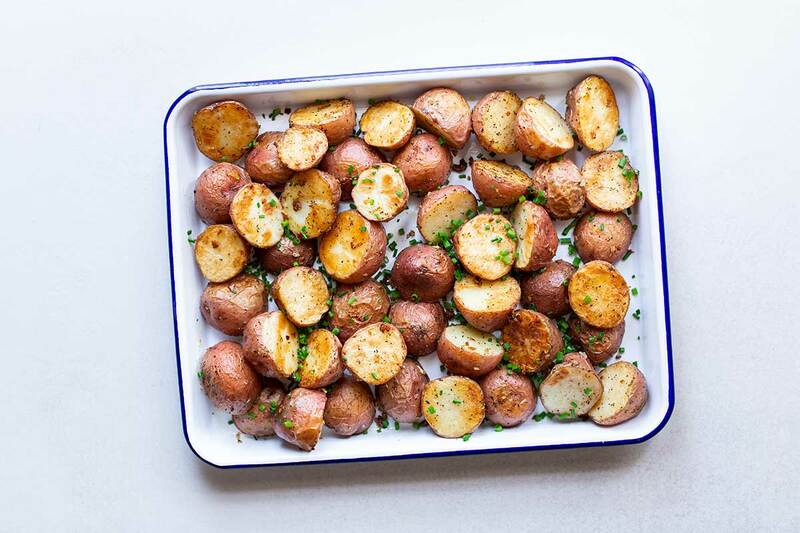 It doesn’t get any better than this easy oven-roasted potatoes recipe! Olive oil, garlic, chives, salt and pepper are all you need to make these amazing, crispy roasted potatoes. They’re a perfect side dish for any meal. Roasting is one of my favorite cooking techniques, regardless of whether we’re discussing vegetables or meats. Anytime you can crisp up and caramelize the exterior of an ingredient using high heat, you’re going to get better flavors and textures. This is why oven-roasted potatoes (and all vegetables, really) taste better than if they’re steamed or boiled. You can even roast fruit! Cut the potatoes to the desired size. Toss in a generous coating of oil (to assist with the crisping and caramelization). Roast in a single layer on a sheet pan until brown and crisp on the outside, and fork-tender in the middle. 3 tablespoons of olive oil might sound like a lot, but don’t skimp. You can even go up to 1/4 cup (4 tablespoons)! Olive oil will enhance that crispy caramelization that makes these so good. I promise they won’t be oily. If you rinse the potatoes right before roasting, thoroughly pat them dry with a paper towel or dish towel before tossing with the oil. Water creates steam, and steam doesn’t help with crispy potatoes. You can add other herbs to the potatoes in addition to (or in place of) the chives. A little bit of finely chopped thyme, rosemary, or parsley would all work well. Times will vary based on your oven temperature and the size of the potatoes. As a general cooking rule, always remember that smaller pieces cook faster. This is useful if you’re short on time! Like all root vegetables, potatoes are very dense, so roasting potatoes will take longer than, say, roasting broccoli. My recipe uses a 400 degree oven, which results in crisp, brown, flavorful potatoes. If you don’t have the time, you can crank up the heat! Just pay attention to the potatoes to ensure even cooking. What Type of Potatoes Are Best For Roasting? For roasted potatoes that are crispy, nicely browned and very easy to prepare, I recommend using red or Yukon Gold. Russets work great as well, but they involve a bit more prep due to their size (you can certainly use them if you already have them). 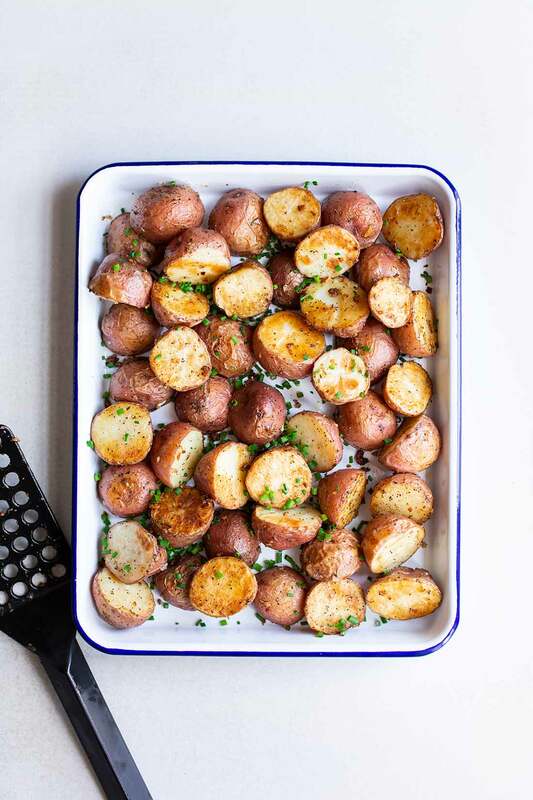 Serious Eats ran a series of tests on which potatoes are best for roasting, and their final picks were Yukon Gold or russet, because red potatoes don’t stay as crisp after cooling down. They also recommend boiling the potatoes first. My ultimate goal here is ease of preparation with the best results, so I skip the boiling and the russets. If you expect to have leftovers, I recommend using Yukon Gold instead of red, since they stay crispy for a longer period of time. I personally like using red potatoes because they add color. There are rarely leftovers, and if there are, they still taste great. Also, if you’re not serving a crowd, you can cut this recipe down by half or more. What Pairs Well With Oven-Roasted Potatoes? Serve as a side with roasted chicken, steak, or slow cooked pork shoulder. Serve alongside breakfast entrees like eggs. These would be perfect with my shakshuka (eggs poached in tomato sauce), or with my Swiss, mushroom and spinach frittata. Serve with stews and chilis. My vegetarian chili would work well! If you love this recipe, be sure to check out my Roasted Broccoli with Garlic and Lemon, Roasted Grape Tomatoes with Oregano and Thyme and Roasted Green Beans with Parmesan, Almonds, and Lemon. 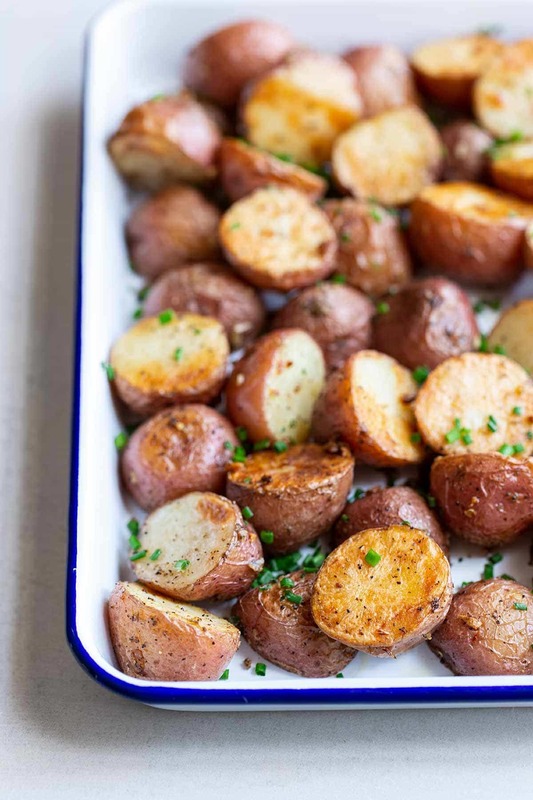 It doesn’t get any better than this easy oven-roasted potatoes recipe! They're a perfect side dish for any meal. Place an oven rack on the center shelf and preheat the oven to 400 degrees F. Line a sheet pan with foil or parchment paper. 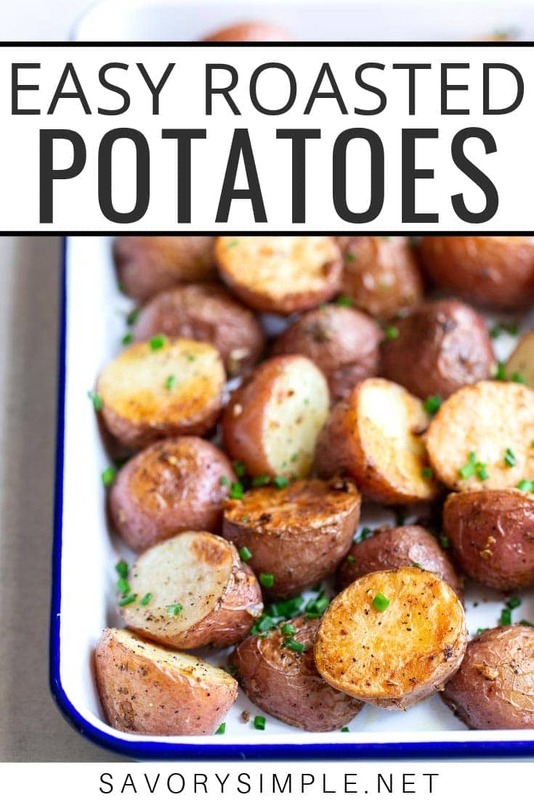 Cut the potatoes in half or into quarters (depending on how large they are; cut them to size you want to eat), and place in a large bowl with the olive oil, garlic, salt, and pepper. Toss the ingredients together until the potatoes are evenly coated. Spread the potatoes in a single layer on the prepared sheet pan, then roast for 45-60 minutes, or until browned and crisp. Stir and flip the potatoes over with a spatula a couple times while they cook to ensure they brown evenly on both sides. Once the potatoes are brown and crispy, remove them from the oven and transfer to a serving bowl. Toss with chives, adjust the seasoning if desired, and serve immediately. Leftovers will keep in an airtight container in the refrigerator for 3-5 days. I like to use red potatoes because the skins add some appealing color. Yukon Gold are also a great choice. Smaller potatoes work better for crispy results, if you can find them. You'll get more skin with each bite, and the skin is mainly what's crisping up. If they're larger, make sure to cut them to the bite size you want. After rinsing the potatoes, make sure to dry them very well with paper towels. Too much water can impact the crispiness and browning, since it creates steam. 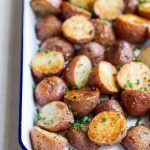 Serving Suggestions: Try pairing these roasted potatoes with my Shakshuka, Buttermilk Chicken, or Slow-Cooker Kalua Pork! These roasted potatoes are so good! Perfect side dish recipe. As someone who has roasted potatoes for many years, l learned one thing that makes them better. Boil the potatoes first for about 4-5 minutes. Drain them and put them back in the hot pot for about 30 seconds to dry and “fluff” them. This allows them to absorb a little of the oil which makes them crisper. Then toss in olive oil. I roast at 425F for about 30 minutes and add thinly sliced garlic tossed in any oil left from the potatoes for the last 10 minutes.